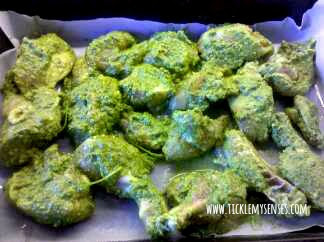 This hot and flavourful chicken preparation is very versatile and can be made in an oven, stove top or in a barbeque. 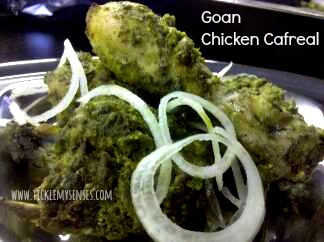 Cafreal is a spicy chicken preparation consumed widely in the Indian state of Goa. The preparation originated from the Portuguese colonies in the African continent. It was introduced into the Goan cuisine by the Portuguese. Small baby chicken weighing 800-1000gms, cut into sixteen pieces. 1. Grind all the above masala ingredients in a mixie to a fine paste. 2. Marinate the washed piece of chicken in the paste for 5 hours or longer (preferably overnight in a fridge). 3. Line a roasting oven tray with baking paper, grease paper lightly. Place chicken pieces in a single layer. Pour 2 and half tbsp oil/ melted butter over the chicken. 3. Place the chicken in a preheated oven middle shelf, cook at 180C for of a total 45 mins or till cooked, turning the chicken over at 25 minutes and basting in its juices and remaining oil/ butter. 4. Chicken cafreal is ready when juices run clear when a fork is pierced into the thigh/ leg. Serve hot with onion rings and a generous squeeze of lemon juice.